Figure 1. 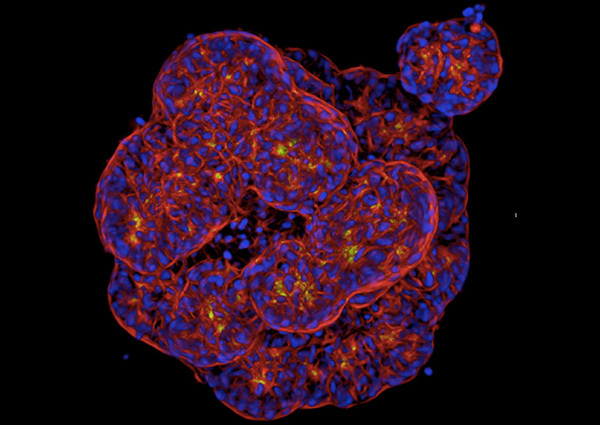 In vitro PDX: Pancreatic tumoroids cultured in 3D from PDX-derived tumor cells (Charles River Labs). PDX tumors were dissociated enzymatically and cells were seeded in a basement membrane-rich protein hydrogel, in 384-well plates, with culture medium formulated to support ex vivo culture (OcellO). Tumor cells self-associate, proliferate, and differentiate morphologically to form tumor tissue with in vivo tumor characteristics. Subsequent automated imaging and image analysis enables quantification of antitumor properties of compounds. Over the past few years, 3D cell culture models have gained great attention because they can promote levels of cell differentiation and tissue organization unachievable in conventional 2D culture systems. These platforms such as organ-on-a-chip, biological scaffolding, or microdrop techniques offer substantial advantages in evaluating disease mechanisms, drug discovery, and toxicity testing and potentially, for tissue-replacement therapies. But these systems present formidable technical hurdles to universally adaptable methods for standardization and validation, including the need for high-content analysis instruments, methods, and analytics relevant to 3D architecture. At Cambridge Healthtech Institute’s 15th annual High-Content Analysis and 3D Screening meeting, held November 2017 in Boston, participants from academia and pharma companies will focus on advancements in HCA technologies and applications, including screening of 3D and physiologically relevant cellular models, data analysis techniques, and will present case studies and strategies for successful drug discovery. Speakers from OcellO, The National Institute of Standards and Technology (NIST), and the Ludwig Institute for Cancer Research at the University of California in San Diego, talked to GEN about what they planned to cover in their presentations at the conference. OcellO, a Netherlands-based contract research organization that offers drug screening and profiling services using 3D cell culture models of disease, says it has expanded the utility of patient-derived (PDX) mouse models by offering in vitro assays using 3D culture of the same tumor materials. OcellO’s high content imaging and analysis platform, it says, enables in-depth evaluation of drug effects in a robust, high-throughput format. He further noted that capturing imaging data through a 3D stack requires a collection of about 50 images. “If done by confocal microscopy, this is slow. If done by conventional wide-field fluorescence microscopy, most of the data collected will be out of focus, so image deconvolution is required,” adds Dr. Price. Dr. Price also noted that a major headache in drug discovery is the translation between in vitro and in vivo studies—results of in vitro studies with cell lines can often not be recapitulated in vivo, partly because the biology of a 2D monolayer and a solid tumor are different and because the cell lines used in vitro differ from the tumors in mice. “Our in vitro PDX model uses the same tumor cells in vitro and in vivo, enabling better translation,” he says. He also described examples of where an unexpected drug sensitivity observed with in vivo PDX studies was recapitulated in the company’s in vitro PDX model. “We have also performed drug screens that have identified the potential therapeutic activity of unique molecules,” he said. Ann Plant, Ph.D., chief of the biosystems and biomaterials division, NIST, describes the development of tools that allow panning and zooming of hundreds of fields of view, permitting visualization of stem cell colonies as they expand and merge over days in culture. Currently, she said, stem cell populations are often characterized using genetic methods. But methods that examine entire populations of cells don’t lend themselves easily to a comparison of individual colonies to one another, or dynamic measurements, and are unlikely to be sensitive enough to identify rare events. “Imaging can provide quantitative phenotypic information and temporal and spatial information. Many image features can be quantified, many cells and colonies can be observed, and statistically rare events can be observed if sampling is sufficient,” she explains. “The method has allowed us to quantitatively compare preparations of stem cell colonies with parameters including colony size, growth rates, and Oct4 gene expression,” explains Dr. Plant. Potential correlations between these features were examined. Despite differences in plating density and colony size, colonies expanded at similar rates. “We also observed heterogeneous expression of Oct4 within some colonies. Rare events, like loss of Oct4 expression, were identified,” adds Dr. Plant. Although it appears that users currently are largely academic researchers, Dr. Plant maintains that NIST’s methodology is useful for quality control of commercial preparations. “Ongoing work in our labs is addressing the use of image features as the basis of release criteria for cell therapy products,” she adds. Rebecca Green, Ph.D., from the Ludwig Institute for Cancer Research, University of California San Diego (working in the laboratory of Karen Oegema, Ph.D.), notes that while high-content screening for gene profiling has generally been limited to single cells, their team approached gene-function profiling by analyzing effects of gene knockdowns on the architecture of complex tissues in a multicellular organism, the nematode Caenorhabditis elegans (C. elegans). But analysis of this developmental dataset is much more complicated. Her team has a detailed time-course of three-dimensional data in two different strain backgrounds, for each RNAi condition. “Altogether, we will have over 27,000 four-dimensional movies to analyze. So, the crux of this project was to come up with automated computational methods to analyze this complicated phenotypic information in a way that deals with an evolving three-dimensional organism,” she says. Dr. Green and colleagues could not use machine-learning-based approaches to analyze this dataset mainly because these techniques require large sample sizes. Instead, they developed automated methods to detect biologically meaningful phenotypic defects. In one strain, the investigators, including Renat Khaliullin, Ph.D.—the postdoctoral fellow Dr. Green credits as the person who enabled the automated approach—dynamically tracked fluorescently labeled endodermal, mesodermal, and ectodermal nuclei to monitor defects in cell-fate specification. A second strain was designed to allow tracking of morphogenic changes during epithelial and neuronal development by monitoring changes in their tissue position and shape (Figure 2). The team accomplished this by measuring the center of mass and moment of inertia, over time, for each fluorescently marked tissue, which can be done by considering pixel intensity values in each dimension, at each time point. Figure 2. Visualizing embryonic development in Caenorhabditis elegans. The embryo on the left expresses fluorescent nuclear reporters for endoderm (green), mesoderm (yellow), and ectoderm (red) to monitor changes in cell fate. The embryo on the right expresses cell-surface markers for neurons (red) and epidermis (green) to monitor morphogenic processes. Key considerations that were addressed in this work, she added, include dealing with highly complex 4D data; challenges associated with small sample size; scoring parameters in continuous, rather than discrete, space to capture a range of phenotypes and gene-gene relationships; and retention of rare phenotypes. “The problems we are solving are problems that anyone dealing with a complex substrate, like a 3D tissue model, would encounter and we think the concept and approach is highly translatable,” Dr. Green concludes. 1. K. Bhadriraju et al., “Large-Scale Time-Lapse Microscopy of Oct4 Expression in Human Embryonic Stem Cell Colonies,” Stem Cell Res. 17 (1), 122–129 (July 2016).